Hot summer days can be brutal, and not only for people. Those hot days can be especially tough on your pet due to their furry coats. 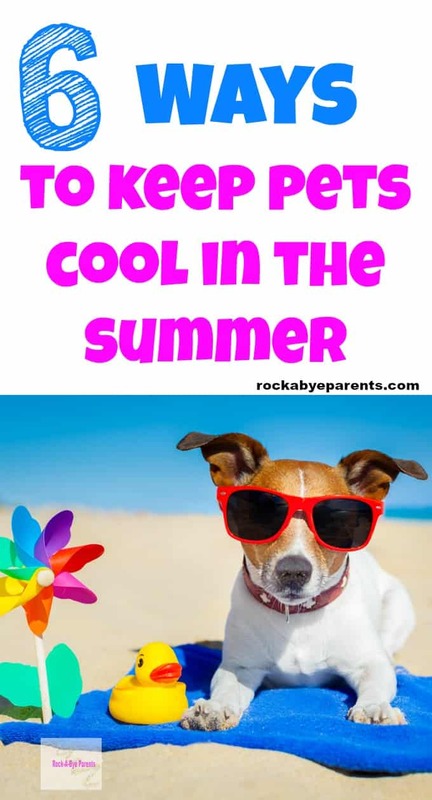 You may be wondering how to keep pets cool in the summer, and luckily there are several things you can do to help them. I luckily live in a cool weather state because I seem to attract pets that don’t do well in heat. My cat has often been known to get sick from getting over heated. 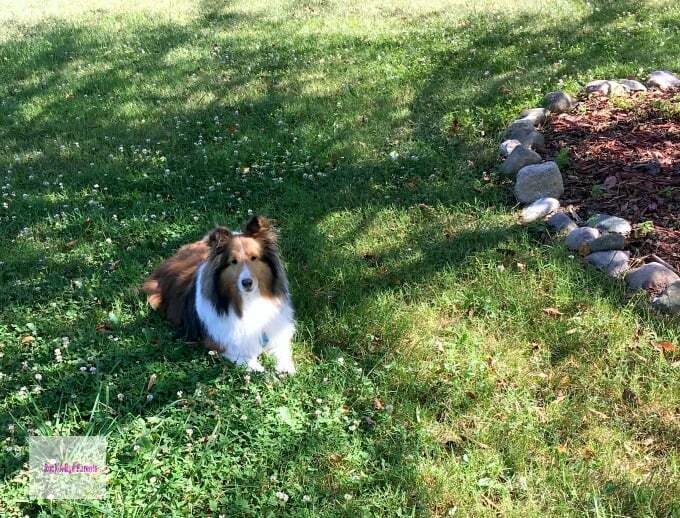 Plus a few years ago we got a Sheltie, and with her thick fur coat she’s panting before temperatures hit the 70’s. Turning on the A/C when it gets hot out is a great way to help everyone cool down, but that isn’t always enough for furry friends. Plus not everyone has air conditioning to turn on. Our first house didn’t any air conditioning, and there were times I had to get creative to keep us all cool. 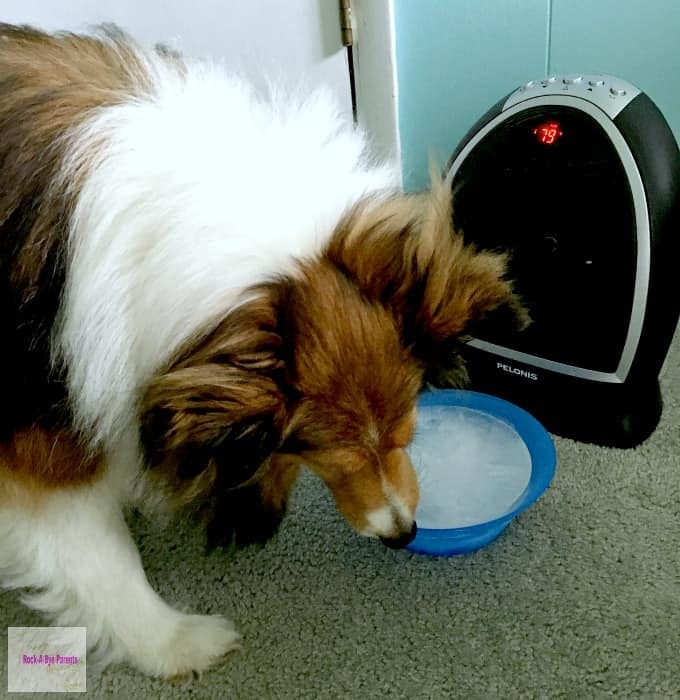 Whether you don’t have AC in your home, or you’re just looking to keep your pet from overheating, here are some ideas for how to keep pets cool in the summer. We hear all summer long about how we need to keep ourselves hydrated. It isn’t any different for our furry friends. When the temps start to rise to make sure that you keep their water bowls filled. If you have a pet that is picky about where they get their drinking water from (I’m looking at you cat!) 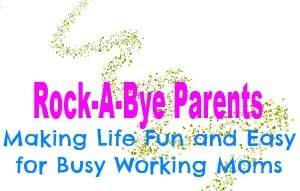 than you may need to try different options. One of our cats wants to drink straight from a faucet, but I’m not always home to turn it on for him. I was able to get him to start drinking from a bowl again though when I bought him a fountain drinking bowl. After trying different fountain bowls out my cat has made it very clear that he likes this one best. The important thing is that your pet is getting enough water every day. Whatever you need to do to get them to drink, do it! When it comes to keeping pets cool we often have to give them a little help. One way is by giving your pet cold water to drink. Keeping your pet hydrated is very important, but a bowl full of cold water can also help your pet stay cool. 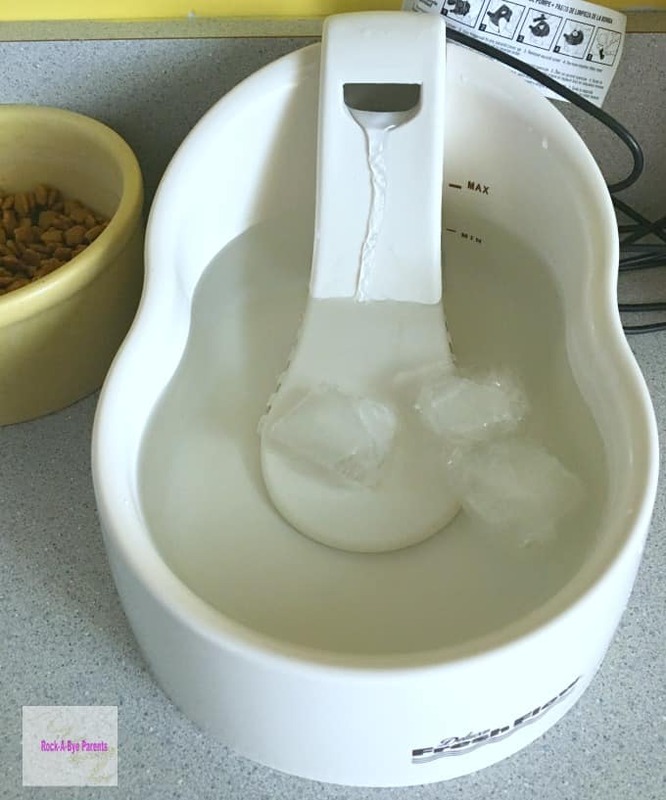 You can easily keep the water in their bowl cool by adding ice cubes to it. For dogs that enjoy getting wet (ours is not one of them) you can fill up a child’s wading pool with water. Letting them play in the water is a great way to keep pets cool in the summer. You actually can even get pet wading pools on Amazon that are designed with dogs in mind. Years ago when we didn’t have any air conditioning I created a system that I called Air Cooling (Disney fans might recognize this from Carousel of Progress). I would take plastic cereal bowls, fill them with water, and freeze them. Then I’d pull them out, one at a time, and set them in front of a fan on the floor. I liked using our portable space heater on the fan setting for this. The fan blowing on the ice would create cool air that my cats (and us too) loved. They’d lay in front of those ice bowls for hours. 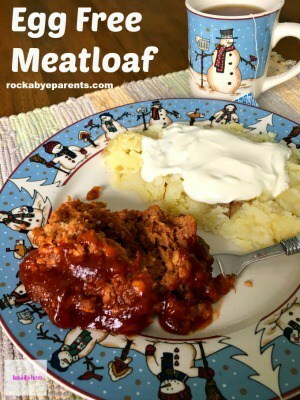 Once a bowl was fully melted I’d put it back in the freezer and bring a different frozen bowl out. Another way to keep pets cool in the summer is by giving them cool places to lay. Our dog especially likes to seek out areas in the house that don’t have carpet to lay down on. There are also different types of pet bedding out there that you can buy. One option is an elevated pet bed. These type of beds are raised off the ground. Since it’s raised off the floor it allows air to flow all around which helps keep your pet cooler. Another bedding option are pet cooling mats. These mats are really neat. You don’t need to put them in the freezer, and they don’t use electricity. They have a special gel inside that keeps the mat at a lower temperature than your pets body temperature making them feel cool. The mats come in lots of different sizes in order to accommodate different sized dogs. Sending your pet to the groomers for a trim or a shave is another way to help keep them cool. This isn’t an option for all pets though. Our Sheltie is one of the types that aren’t supposed to be shaved. She has such long fur, but her coat adjusts for different temperatures to keep her warmer or cooler. We do make sure to keep her trimmed though so she doesn’t have any more fur than she needs to. If you’re not sure whether your pet can benefit from a trip to the groomers do a quick Google search or contact a dog groomer and ask them. Being outside in hot temperatures is not good for your pet. You can help them by taking them outside during cooler times of the day. One thing that helps is taking them for a walk in the morning before the heat of the day arrives or once it has started to cool off. Not only can walking in the hot sun overheat them, but their paws can be hurt by the hot pavement. It’s also a good idea to take a water bottle for your dog on your walk as well as for you. 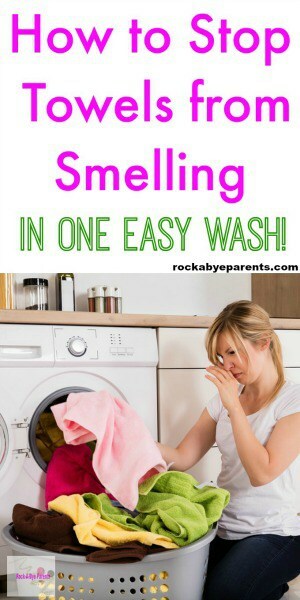 You should also try to keep them inside during the hottest parts of the day as much as you can. When they are outside be sure that there are shady areas in the yard for them to lay in. If you don’t have much tree shade in your yard you can create some by putting out a large umbrella or a tarp. If you’re reading this post I think it’s safe to say that you care a great deal about your furry friends and that you want to do everything possible to help keep them comfortable during the hot summer months. Still I think it’s important to add a reminder that you don’t want to leave your pet anywhere that they could quickly become too hot without any way to cool off. This is especially true in a hot car. Temps in a car, even with the windows cracked, can escalate quickly. It doesn’t take long for a pet to overheat in such a situation. The hot weather months can be difficult for pets with their warm furry coats. 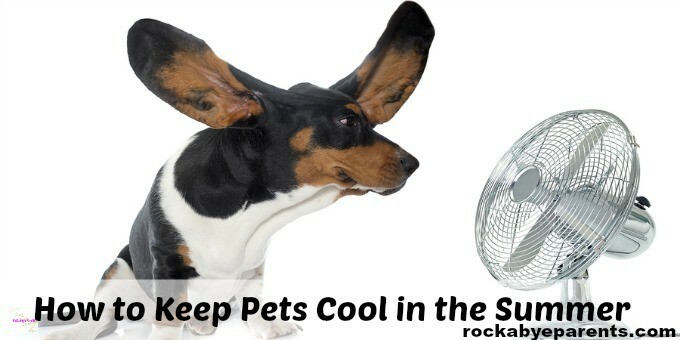 Luckily there are a lot of things you can do to keep pets cool in the summer. 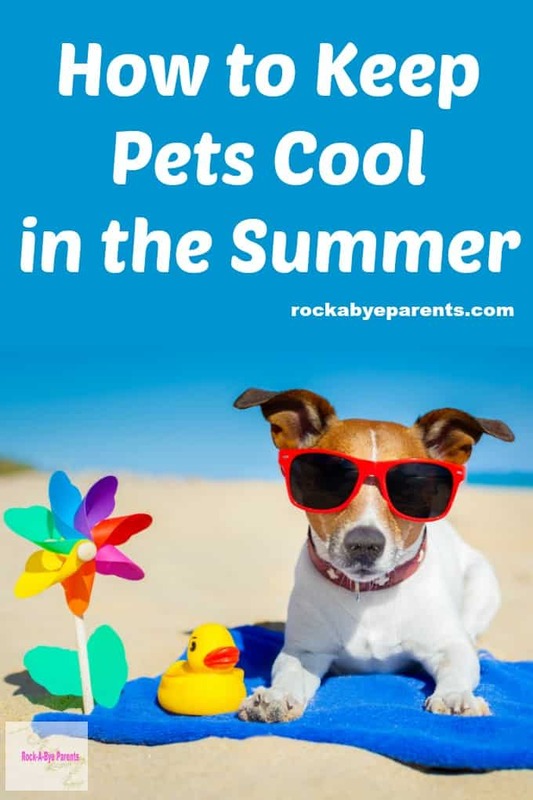 I hope these ideas help you and your fur babies have a great and cool summer! 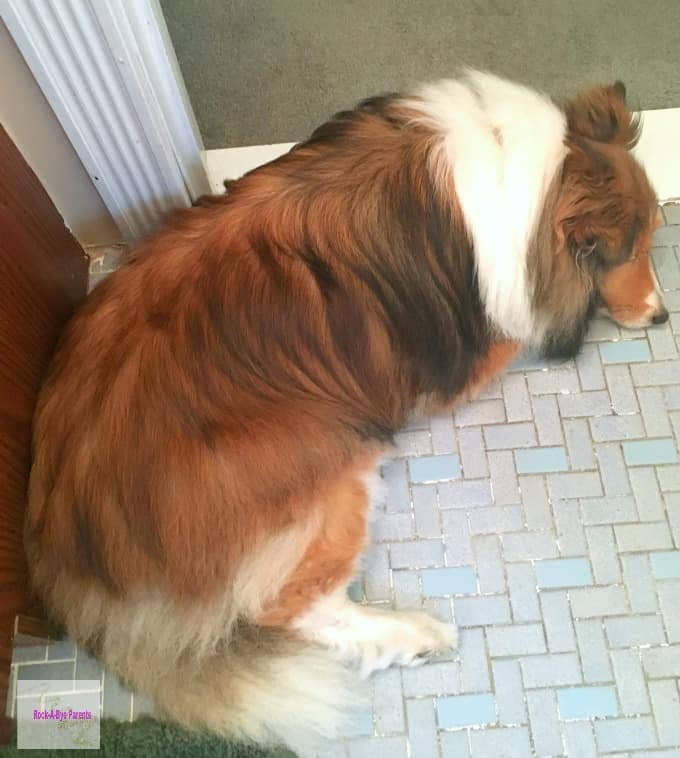 This post is very timely, I have a dog that I am fretting about being too hot. He gets lots of water, eats the odd ice cube, but is terrified of fans. Oh poor thing! 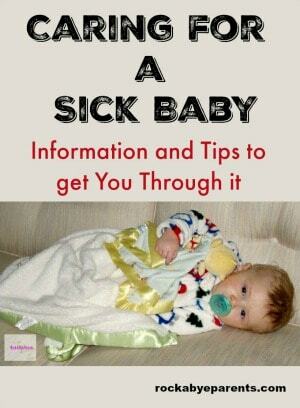 I hope a few of these tips help him!